You will need Node and npm or Yarn installed on your machine. Realtime chat functionality has revitalized the way we communicate over the years. In recent times, customers can speak directly with business owners from their mobile applications and websites. This is a huge plus in technology considering how difficult it was in the past. 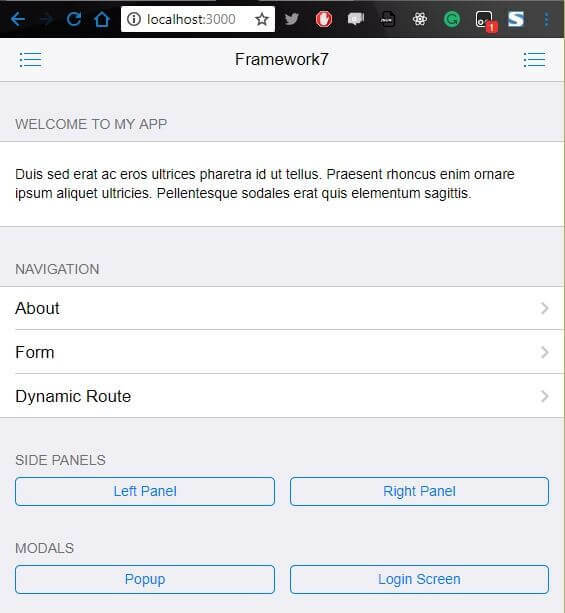 Framework7 is a free and open source mobile HTML framework to develop hybrid mobile apps with iOS and Android native look and feel. 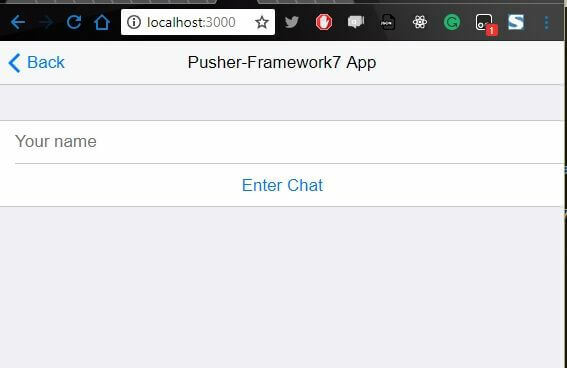 In this tutorial, we'll build a realtime chat application with Framework7 using Pusher channels. Here’s a preview of what we’ll be building. Before you begin, ensure that you have Node and npm or Yarn installed on your machine. Here is a run-down of the core technologies we will be using. 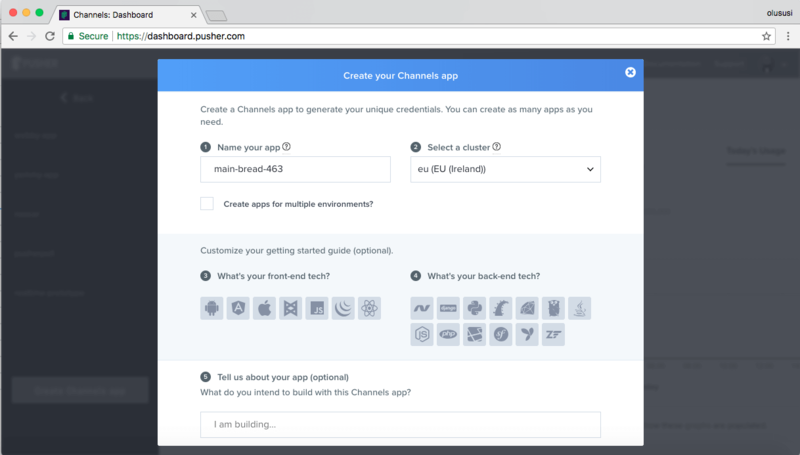 Pusher - Pusher is a technology for building apps with varying realtime needs like push notifications and pub/sub messaging. It is the engine behind the realtime ability of our chat app. If you get any prompts in the process, it is always safe to say yes within the scope of this demo. 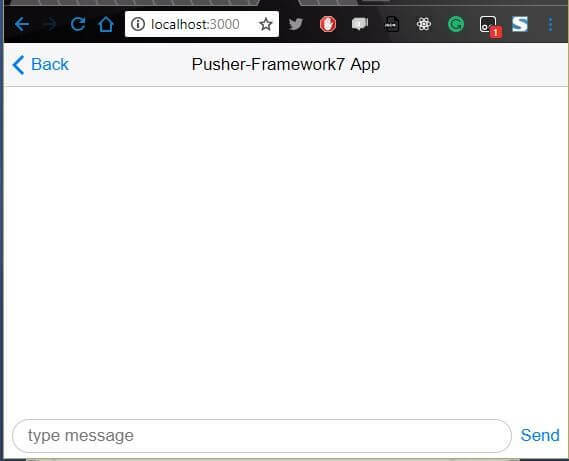 The phonegap serve command will start your project on localhost:3000. If you navigate to it on your browser, you should see this. Save your Pusher credentials somewhere in your editor where you can quickly retrieve it as we’ll be needing it soon. Do not forget to replace the placeholder values here with your unique keys from Pusher. 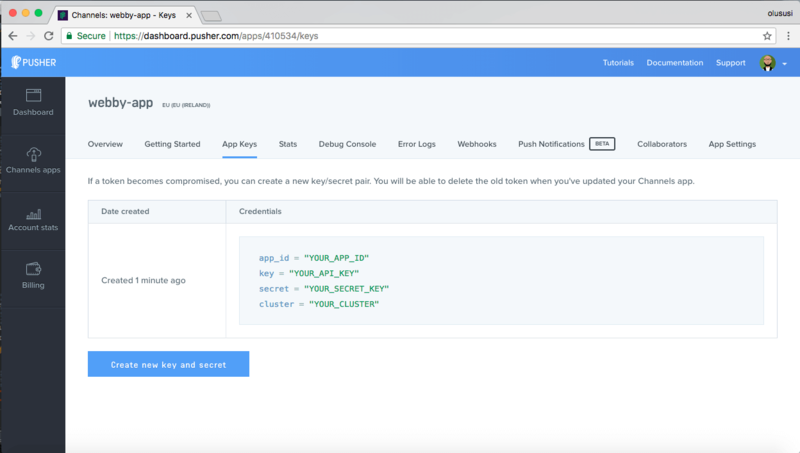 Here we loaded all the necessary middlewares for the Express server and then configured Pusher using the credentials we got from our Pusher dashboard. We also created the /``message endpoint that will receive and process messages sent in from our app. 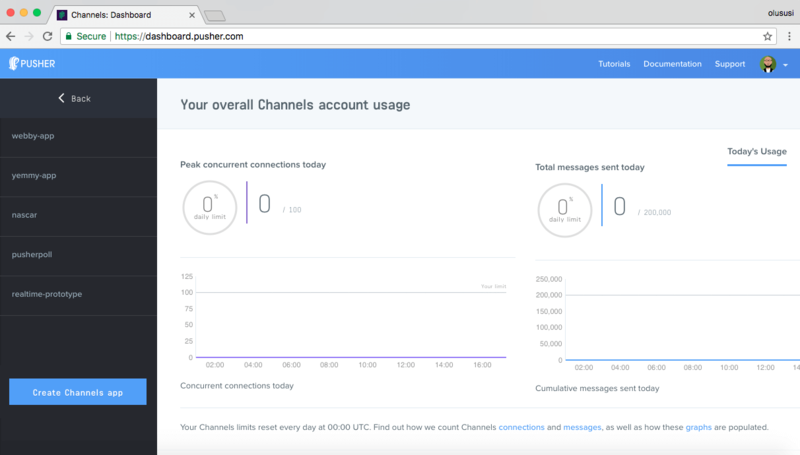 Finally, we trigger an event named message to Pusher Channels on a channel called chat. The chat channel holds a message payload that contains the message sent by the user. Here we defined a states object to hold the name of the user and an array of messages. Then we added the missing callbacks that we defined in our HTML file to handle the click events on the buttons. If the user supplies a name and clicks the Enter Chat button, it’ll open up the chat page, but if that is not the case, it’ll alert the user to a name. Update your app.js file with the snippet above and save. Now go back to the browser, enter a name and click Enter Chat. This should now open up the empty chat page. 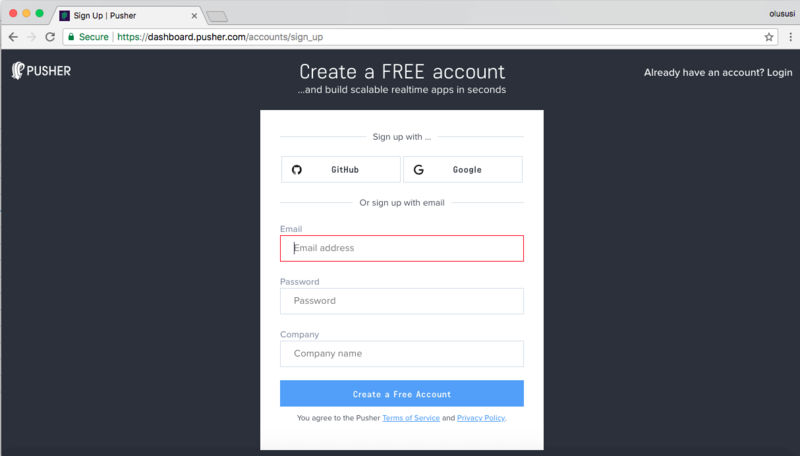 This sets up Pusher in our client with the credentials from our dashboard. We subscribe to the chat channel we defined on the server and bind our response data to the appropriate view objects to display them on screen. Here we define a message object that takes the name of the user and text message to send. Then we use Axios to post the message object to the /messages endpoint we defined on the server. To test out the application, ensure that both Phonegap server and the Node server is running. If that’s not the case, you can start the Phonegap server in project root with phonegap serve and the Node server with node server. Before testing your application, I recommend you compare your codes with mine to ensure that you did everything right so as not to encounter any blockers. Compare your index.html with mine here, server.js here and app.js here. If everything looks alright, now go ahead and test the application. The importance of realtime engagement of users on any platform cannot be overemphasized. 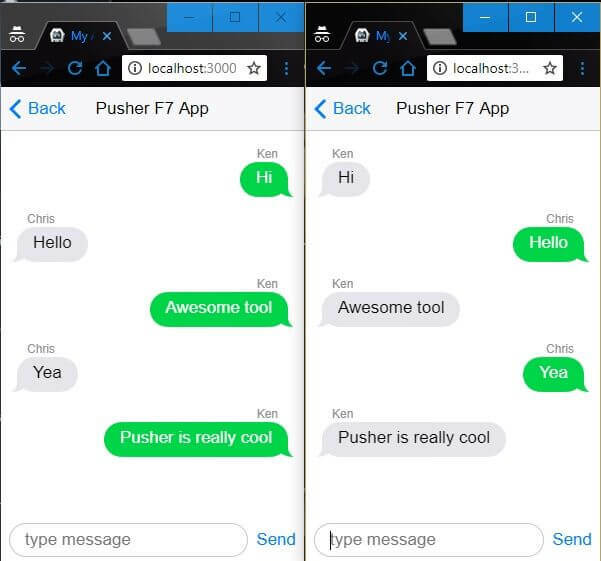 As seen in this tutorial, we were able to implement a realtime chat system with Framework7 and Pusher. I hope you found this tutorial helpful.